Zoom around the circuit with this supercool 2-in-1 replica of a real-life race kart, featuring a detailed engine with moving piston, fuel tank and huge exhaust pipes. Tilt the sleek orange racing seat to reveal the working transmission. Then jump aboard and check out the working steering, two-speed gearbox and cool foot pedals! This ultra-fast machine comes with an awesome purple and orange color scheme, slick tires and cool racing stickers! Rebuild it to create a powerful Track Car. Interactive, 3D Digital LEGO® Building Instructions app available online, for both models! 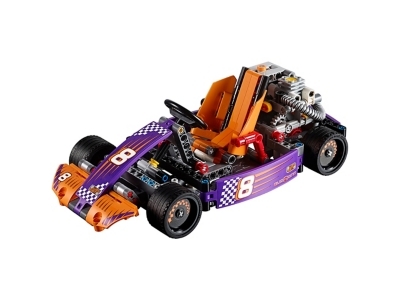 The Race Kart (42048) Lego set is no longer directly available from the sites below. However, 3rd party partners of these sites might still have the set available. Alternate description Take first place on the grid with the 2-in-1 Race Kart, featuring wide slick racing tires, working steering and gearbox, and a detailed engine with moving piston.